Silliness: It’s the middle of congressional recess, which means lawmakers are back in their districts meeting with folks. Alaska Democrats took the opportunity to go on social media and criticize U.S. Sen. Dan Sullivan, Congressman Don Young, and Sen. Lisa Murkowski for not holding town hall meetings at their Democrat-foot-stomping demands. Uh, Sullivan is in uniform this week, training with the Marines, and next week he’ll be meeting with Inupiats up at the Fort Wainwright area. Rep. Young has been throughout Southeast Alaska meeting with constituents. He was spotted in Ketchikan, Wrangell, Petersburg and Juneau, last we heard. And Sen. Murkowski has been in Ketchikan, greeting the arrival of a Coast Guard vessel. It’s not that hard to keep up with our delegation, if that’s what Democrats really want to do. In Juneau, the Glacier Valley Rotary Club will be hosting its annual Pillars of Freedom speaking series, and among the inspirational speakers this year is a hometown hero, bronze medal recipient Brandon Stone. Stone is the son of the late David Stone of Juneau. Watch for a profile of Brandon on these pages soon. And get your tickets at Hearthside Books. Join Americans for Prosperity Alaska and other supporters of bringing ride-share companies like Uber and Lyft to Alaska at a rally on Friday, April 14. The event is from 6-7:30 pm, location is 49th State Brewing Co., 717 West 3rd Avenue, Anchorage. They’ll have drink tickets and ways for people to send letters of support to our representatives, to encourage them to pass SB-14 as it stands, on the House floor. Contact Ryan McKee at 907-841-3274 or by email: rmckee at afphq.org. Sen. Mike Dunleavy lost most of his staff when he cut himself out of the Senate Majority Caucus, and now he has fun ending every sentence with “because I’m running for governor,” which is all he is hearing these days at the Capitol. Daniel George and Christa McDonald, two highly qualified staffers, are on the job market — but with their skills, they won’t last long, we hear. 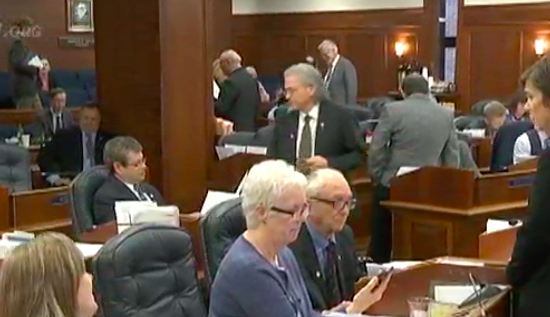 Friday is Day 88 of the Alaska Legislature, and the House and Senate still haven’t appointed the conference committee for the budget. This is going to take a while. The University of Alaska Board of Regents passed a resolution opposing the Senate’s proposed use of the Alaska Performance Scholarship, the Alaska Higher Education Fund. The vote was unanimous. The Senate majority cancelled meeting in joint session with the House today. The meeting was to confirm some of the governor’s appointments, such as Attorney General Jahna Lindemuth and Human Rights Commission nominee Drew Phoenix. If they are not confirmed by ajournment, the governor will have to start over. This is all about the budget, although these two nominees have unrelated problems with their confirmation.